If you put your hand in a bucket of water and swirl it around until the water inside looks like a miniature hurricane, and then you take your hand out…what happens to the water? In just a few minutes the water returns to its former state and it doesn’t appear that your hand was even there. We don’t live in water (I am glad). What we do DOES make a difference in somebody else’s life. Even if we are not aware we have made a difference, we still do. So many times we just don’t see it. Recently, a lady told me how my life had impacted hers several months before. I had no idea. We do not know what we do not know. Making a difference is a little like having dominoes all lined up. When you touch one domino, it touches the next and they all fall down….also known as the “domino effect”! Unlike dominoes, when we make a difference in someone’s life, we cannot track how many more people will benefit from what we did. It may have an impact on someone you will never know. Have you heard the story of the middle-aged pilot (Captain “Sully”) who landed his plane on the Hudson River. I have never met Captain “Sully,” but he has had a profound impact on my life. (Do you see the domino effect?) I want to pass on what I have learned. Sully attributed his success to the fact that all of his life’s experiences prepared him for that few moments in time. He saved 155 lives! As we get older, somehow, we start thinking that the best is past. We overlook the value of where we are. It is not too late to make a difference! What about the “sum total” of our experiences? Do they have any value? Is there something we have learned we can share with someone else to make their life more meaningful? There are many opportunities to volunteer at Northwest Neighbors Connecting, but the services not only help NNC members, they also benefit YOU! There is some evidence to support that fact! Chava is a member of our Maryland Aging in Community CoP. Many of us wake up to the experience that aging in community creates a way to build connections that help us tend to increased vulnerability of later life with friends and neighbors who care. At the risk of sounding like a Hallmark card I have to say that I have seen great tenderness and care shown between friends when the challenges of later life increase our vulnerability. Love and respect from those who know us, see us clearly and stand by our side during challenges is critical if you wish to age in community until you need to call hospice for end of life care. Since many Village and similar Aging in Community neighborhood programs work with each other on coping with the challenges and bumps in the road that emerge in later life strengthening relationships is essential. This level of connection is essential for neighborhoods and Villages that are working to develop a Master Aging Plan for each member to be better prepared to face challenges on the journey of aging. In my work with programs we find the circle of trust approach to be very useful. Everyone has an inner teacher. Every person has access to an inner source of truth, named in various wisdom traditions as identity, true self, heart, spirit or soul. The inner teacher is a source of guidance and strength that helps us find our way through life’s complexities and challenges. Circles of Trust give people a chance to listen to this source, learn from it and discover its imperatives for their work and their lives. Inner work requires solitude and community. In Circles of Trust we make space for the solitude that allows us to learn from within, while supporting that solitude with the resources of community. Participants take an inner journey in community where we learn how to evoke and challenge each other without being judgmental, directive or invasive. Inner work must be invitational. Circles of Trust are never “share or die” events, but times and places where people have the freedom within a purposeful process to learn and grow in their own way, on their own schedule and at their own level of need. From start to finish, this approach invites participation rather than insisting upon it because the inner teacher speaks by choice, not on command. Our lives move in cycles like the seasons. By using metaphors drawn from the seasons to frame our exploration of the inner life, we create a hospitable space that allows people of diverse backgrounds and perspectives to engage in a respectful dialogue. These metaphors represent cycles of life—such as the alternation of darkness and light, death and new life—shared by everyone in a secular, pluralistic society regardless of philosophical, religious or spiritual differences. An appreciation of paradox enriches our lives and helps us hold greater complexity. The journey we take in a Circle of Trust teaches us to approach the many polarities that come with being human as “both–ands” rather than “either–ors,” holding them in ways that open us to new insights and possibilities. We listen to the inner teacher and to the voices in the circle, letting our own insights and the wisdom that can emerge in conversation check and balance each other. We trust both our intellects and the knowledge that comes through our bodies, intuitions and emotions. We live with greater integrity when we see ourselves whole. Integrity means integrating all that we are into our sense of self, embracing our shadows and limitations as well as our light and our gifts. As we deepen the congruence between our inner and outer lives we show up more fully in the key relationships and events of our lives, increasing our capacity to be authentic and courageous in life and work. A “hidden wholeness” underlies our lives. Whatever brokenness we experience in ourselves and in the world, a “hidden wholeness” can be found just beneath the surface. The capacity to stand and act with integrity in the tragic gap between what is and what could be or should be—resisting both the corrosive cynicism that comes from seeing only what is broken and the irrelevant idealism that comes from seeing only what is not—has been key to every life-giving movement and is among the fruits of the Circle of Trust approach. Where are YOU looking for GOLD? and heard an old prospector say, “ ere’s GOLD in them there hills.” (My mom was quick to point out that it wasn’t proper English, BUT I got the point of his statement.) He believed there was hidden value in those hills. for. I read an article once about a break-in at a store. An unidentified person had entered the store undetected and had changed the prices on many items. (That was before the day of bar codes.) The price of expensive merchandise was changed to cheap prices. The cheap things had big price tags. No one discovered what had happened until later in the day. They had been robbed in an unconventional way. The lesson for us is that sometimes we put value on things that are not all that important, and we put little value on things that have great value. My dad used to tell me, “Don’t sacrifice the eternal on the altar of the immediate.” Know what is truly valuable. 2) HOW do WE know it has value? When I was teaching school, I took a new $20 bill to school for show-and-tell. I asked my students, “What is this?” They confirmed that they recognized that it was worth $20 and they could use it to buy things. I then spit on the bill, crushed it into a tiny ball, put it under my foot and stomped on it. I am sure you can imagine the shocked looks on the faces of my young students. I slowly unfolded the bill and asked, “Now what is it worth?” One little boy said, “Nothing!” “Do you mean to tell me that I can’t buy anything with this?” He changed his mind and agreed you could still spend it. Why is it still worth $20? Itis still worth $20 because it was created to be a $20 bill. Its value did not depend on how it was treated. It was created with value. Sometimes we think our value is determined by how we are treated. We have value because we were created by God to have value. 3)Where do YOU look for gold? You don’t go “prospecting” where you do not see the value you want. For instance, if you are looking for gold, you wouldn’t use a fishing pole in a lake to find it. You would find fish there. I heard someone say once, “People are the currency of Heaven.” What we invest in people has eternal value. I had seen had changed. I realized that my attitude has the same effect as my dark glasses. My attitude affects how I see the world around me. 5) If we think there is value in the lessons we have learned during our lives, we will act differently NOW. We will want to share the wisdom and skills we have learned. 6) We are not too old to make a difference. When one of my favorite friends was 100 years old she was still making a difference in the world around her just by being who she was—connecting and communicating with those who came to help her. She was blind and had to have assistance to get around, but she inspired a young aide to quit smoking and much, much more! Determine what is valuable and important to you. Do an attitude check. Does my attitude keep me from the very thing I want? Decide to take the first step in reaching out to connect to Northwest Neighbors Connecting (NNC). Discover new opportunities to “prospect” and make a difference. “Everyone who is born holds dual citizenship, in the kingdom of the well and in the kingdom of the sick. Although we prefer to use only the good passport, sooner or later each of us is obliged, at least for a spell, to identify ourselves as citizens of that other place,” according to writer Susan Sontag. And for those of us over 65, it is estimated that 70 % will need long-term care services as we become sicker and weaker at the end of life. Accepting the need to go to a nursing home is one of biggest challenges in life, physically and emotionally. A goal is to make nursing homes feel more like home. Policies such as a choice of alternative meals and snacks are now in place, for example, as well as a stronger grievance procedure. In Kent County there are two nursing homes, in addition to one at Heron Point Continuing Care Retirement Community. I spoke with the managers at each of those to see how the new rules affect day-to-day life for the residents. Tammy Hardy-Fauber, Administrator at Heron Point, says that their Willowbrook Court Nursing Home is “well ahead of the curve.” One of 21 Acts Retirement Life Communities, she says that Acts standards exceed those required by the new laws, “with a focus on individual or ‘person centered’, care, i.e., choices of medication administration times, meal & snack times/choices, etc.” She added that Willowbrook was rated as one of the top 1,000 nursing homes in the 2016 U.S. News and World Report magazine, and scored as a top Maryland nursing home a 9.5 out of a possible 10 in the 2016 annual Maryland Health Care Commission Nursing Home Survey. “Emphasis will be on ‘choice’,” at UM Shore Nursing & Rehabilitation Center at Chestertown, according to Stu Seitz, Director. “We already have the architecture in place, and little tweaks will be done,” he says. He notes that the facility is already in compliance, with lots of oversight, but that written policies and procedures will be updated with even stronger language to increase the protection and safety of residents. Autumn Lake Healthcare at Chestertown (formerly Chestertown Nursing and Rehabilitation Center) is one of 14 centers in Connecticut, New Jersey, and Maryland. Review the Nursing Home Compare data base (www.medicare.gov) to read the findings from the most recent inspections done of each facility. Exercise and physical activity are an integral part of physical and mental health. Being physically active allows you to do the things you love and enhances your ability to stay independent as you age. Health experts agree that regular physical activity over extended periods of time produces long-term health benefits. Additionally, regular exercise and physical activity reduces your risk of developing certain diseases and disabilities as we grow older. In some cases, exercise can serve as part of an effective treatment plan. Research shows that regular exercise can help manage or prevent arthritis, heart disease, breast and colon cancer, osteoporosis, diabetes, high blood pressure, depression, loss of strength, balance problems and/or difficulty walking. The benefits you gain from physical activity will depend on your starting point and how much effort you put in. Some individuals may be able to jog five miles, while walking for five minutes may be challenging for others. Do not to compare yourself to anyone! It is crucial to match your physical activity to your own needs and capabilities. We are all exercising because we care about our future! Which type of exercise should I choose? Exercise generally falls into one of four main categories: endurance, strength, balance, and flexibility. However, some exercises will incorporate more than one category; for example riding a bicycle uses all four. Endurance–or aerobic–activities increase your respiration and heart rate, therefore improving the health of your heart, lungs, and circulatory system. These activities help keep you healthy, improve your fitness, manage or lose weight, and maintain your ability to do the things you enjoy. Examples of endurance activities include: walking, yard work, dancing, jogging, swimming, bicycling, hiking, climbing stairs, and tennis. Improving your strength is often referred to as resistance training. Similar to endurance exercises, resistance training increases your breathing and heart rate and has many of the same benefits as endurance activities. However, the main benefit to resistance training is to help maintain one’s ability for everyday activities such as climbing stairs, carrying groceries or a load of laundry, playing with a grandchild, and using the bathroom. Our balance naturally decreases as we age, but with appropriate exercises we can combat and even reverse loss of balance. Balance exercises help improve posture and quality of walking. Balance is also important for many everyday activities such as climbing stairs. These exercises help reduce the risk of falling and fear of falls, which is a common problem in older adults that can lead to debilitating injuries or even death. Balance exercises can be completed as often as you like and include standing on one foot, heel-to-toe walk, grapevine walk, and yoga. Stretching can help your body stay flexible and limber, which will also help improve balance. Increased flexibility will increase your range of motion during both regular physical activity and everyday activities. You can increase your flexibility through exercises such as yoga and strength training, or by obtaining a stretching program from a fitness professional. Eric Fitch, is a graduate of Towson University with a B.S. in Physical Education. Eric is also a Certified Personal Trainer, group fitness instructor, orthopedic exercise specialist, and lifestyle and weight management consultant through the American Council of Exercise. Eric and his partner Jennifer Koch (Certified Personal Trainer, Pilates instructor, and nutritionist) are the owners of Physically Fitch in Chestertown (eric@physicallyfitch.com). Check out these ideas from greatergood.berkeley.edu. Article: “Five Science-Backed Strategies to Build Resilience”. -Written by Kira M. Newman on November 9th 2016. I am a fan of expanding resilience for individuals and communities. Learning how to maximize our capacity for resilience is important as we navigate growing older. One of my projects while I was at Westat was on building community resilience and helping communities respond to people who were experiencing emotional challenges during times of stress like during the economic down turn. I loved investigating what tools and actions seemed to be effective during our evaluation. During my years as a counselor and community connections organizer I have witnessed that it is possible for all of us to expand our learning of new healthy ways to move through adversity. Expanding our skills, adding tools into our personal tool-box is part of strengthening our resilience. Some of my favorite coping strategies include journal writing, poetry, art practices, tai chi, qi gong, massage and the skillful touch of bodywork…along with community “listening circles”. Tending your own capacity for relaxation and creative expression in a safe community circle that can have a profound impact and can help you recover more quickly, or at least start heading in that direction. At Berkeley, The Greater Good Science Center has collected many resilience practices. You can find some on their website Greater Good in Action, alongside other research-based exercises for fostering kindness, connection, and happiness. I hope some of these tools will support you when you face times of challenge. Here are just a few examples of the resilience practices they share. Please check out their website for a more detailed description. One of the most commonly studied mindfulness programs is the eight-week-long Mindfulness-Based Stress Reduction (MBSR), which teaches participants to cope with challenges using a variety of meditation practices (including the ones detailed below). The folks at Greater Good note that these examples and other practices on their site can help you cope with difficulties when they arise, but also prepare you for challenges in the future. With enough practice, you’ll have a toolbox of techniques that come naturally—a rainy-day fund for the mind, that will help keep you afloat when times get tough. Just knowing that you’ve built up your skills of resilience can be a great comfort, and even a happiness booster. We older adults grudgingly acknowledge that age is a risk factor for illnesses and injuries. And our goal is, of course, healthy aging. “While we are seeing increases in the lifespan, healthy aging is still a challenge,” according to Pamela Ouyang, Professor of Medicine at Johns Hopkins Bayview Medical Center. Falls are among the most serious and common problems that threaten our health and independence, and are the leading cause of death by accidental injury for those over 65. Although many falls do not result in an injury, falling once doubles your chances of falling again. Muscle loss, that comes with getting older, is a significant risk factor. “Sitting is the new smoking,” according to Ouyang. While there are circumstances that we cannot change, we can reduce our fall risks by staying active. “Considerable evidence now documents that the most effective (and cost-effective) fall reduction programs have involved systematic fall risk assessment and targeted interventions, exercise programs and environmental-inspection and hazard-reduction programs,” according to Laurence Z. Rubenstein of the UCLA School of Medicine and Geriatric Research Education and Clinical Center. He notes that the U.S. Public Health Service has estimated that two-thirds of deaths due to falls are potentially preventable, based on an analysis of causes and circumstances of serious falls. And the big one: Exercise. Those who fear falling can benefit from custom-designed balance exercises, prescribed by a physical therapist. Ask your doctor for a referral. A smart idea is for seniors or family members to review a home safety check list such as the one offered by AARP here! A year and 1 week of Caregiving – there is no day off. One of the fastest growing professions created to assess and coordinate services for families and older adults are geriatric care managers. They often act as liaisons to families at a distance, offer support, advocacy, and provide information, referral, and placement in long term care environments. Unfortunately the service is often requested under crisis intervention. The author of the following blog has been in the field of aging for almost 30 years and is a Geriatric Care Manager (emeritus). When the “client” is your mother, it takes all acquired skill sets, knowledge, and ingenuity to make a successful plan. It has been one year and one week since my mother fell in her home while making dinner and 8 months since the massive stroke that reduced the stoic stubborn Phi Beta Kappa educator to living in her hospital bed in her sunroom with 24/7 care. But who is counting? Yes, it is the caregiver daughter who is very aware of the days and weeks that have passed. There was probably no one better suited to this fate than my mother. Her daughter (me) had an almost 30 year background in aging, including her own Geriatric Care Manager practice, and had helped her father with a seven year caregiving odyssey fifteen years earlier. This daughter knew how her mother had lived her life and knew how she would have wanted it to end were she willing or able to express her wishes. The daughter was willing and able to help bring the mom’s wishes and unspoken “plan” to fruition. But the biggest lesson for all of us to know is that making plans and care giving for a parent’s end of life is not for sissies. It takes fortitude, patience, creativity, love, and persistence. In between those descriptive nouns are more ominous feelings of impatience, irritation, fatigue, worry, and challenges. The challenges are the unexpected rifts in the schedule that jar the rhythm of life. It is the live in caregiver who has my mother’s best interests at heart, but suffers her own inability to set boundaries and sudden senses of urgencies. It requires mental agility to both nurture and manage the other 3-6 caregivers who float through the home during the week, each with their own personalities and lives of drama. Preserving the dignity of my mother as well as maintaining her home and the paperwork that defines her still living here in our world takes ingenuity and intellect and most importantly a loving and supportive “admin” husband. Because I have succeeded so far doesn’t mean that the “darker” thoughts of “when will this end?” or “does it really matter” have not entered my mind at times. These thoughts reflect the conflicts of living and dying for my mother and balancing her needs with my desire to thrive and find my own bliss. The irony of these two thought patterns does not escape me. Why do I still do this some might ask? Most may have given up by now and admitted my mother to a nursing home. The increasing fragility and vascular dementia might be the green light to go ahead and let others take over the caregiving duties. Why persevere? First of all, my mother is happy. She smiles many times every day. Whether the stroke hit her funny side of the brain or she has let go enough to say, “This is it – so be it”….she laughs every day. She watches her “I Love Lucy” series and Carol Burnett and musicals on TV on a small tray next to her bed and seems “to get” the characters and the skits. She is peaceful and calm as is the atmosphere around her. She has several longtime friends who come to visit occasionally to sit and share life stories. She may only say one word during the visit, but the visit is in her home at the time that works for her. She gets organic butternut squash and fresh made lamb broth and pasteurized egg custard when she wants it and on her own schedule. She has wonderful personal care and sleeps and eats as she wishes. She is on no medication and in no pain. Her life right now is as “natural” as the day she was born and it matches her desires. We do have some geriatric nurse practitioners who are part of our team that not only understand what we are trying to accomplish but champion us each step of the way by “empowering” and not “directing” the end of my mom’s life. 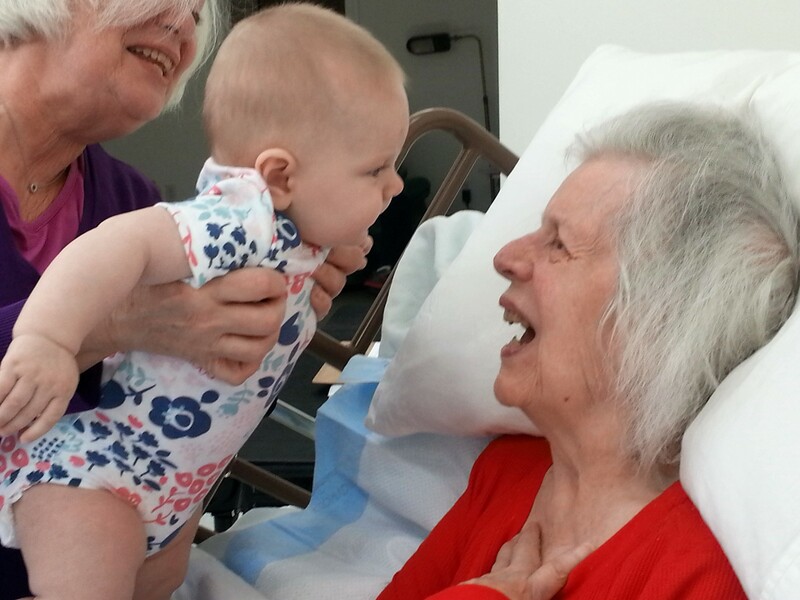 Mom’s first great grandchild arrived last November 23. We have primed Mom for the baby visits and she seems to understand that this beautiful little baby girl is related to her. When I told her that the baby was moving to Phoenix, she looked thoughtful as she digested the news. By the way, the new grandbaby is named Lucy, and so when I ask Mom if she loves Lucy, that really makes her laugh – and I am not sure if the joke is on me! There is but one end to my mom’s story although we do not know the how or when. As I continue on this journey with my mom, I will continue to reflect on the valuable lessons for living a good life to the end, without medical intervention, in the comfort of one’s own home, and with laughter in the air. This journey does not happen without a plan, a strong advocate, resources, and a moral imperative. Hopefully this final transaction with my mother will give her a peaceful afterlife and for me a peaceful life after. Growing Community and Gardens at the Same Time! Although the ground is snow covered in much of our state this final week of February-my friends who study Chinese medicine insists we are on the trajectory for spring’s arrival. I have hope. My husband has ordered his seeds and several friends have tiny seedlings sprouting under sunlamps in their guest rooms. If you are not lucky enough to be spending February enjoying baseball Spring Training camp in Arizona or Florida maybe you are dreaming about a garden project? Recently I visited a coffee meeting at a village nearby and met the Vice-President of Silver Spring Village, Peggy Gervasi who shares the following examples of how her village is connecting with gardeners. Gardening, & community : I didn’t expect to learn how to prune crepe myrtle! I’ve been with the Silver Spring Village since summer of 2013 – just a few months after I retired from the Federal Aviation Administration and just before the Village launched. Before my retirement during the vulnerable years when my parents’ health declined I was a caregiver and learned so much about what people need during vulnerable times. We helped them make sense of medications, discharge instructions, and insurance, and taking care of paperwork and the house. As we provided care I wondered how people without our family’s education, resources, and support system managed these life transitions? Who do they turn to when they are at their most vulnerable and most confused? In my encore career, I wanted to create a community of friends and neighbors who would help their older neighbors through difficult times and a community that would be there when my husband and I needed it. Imagine my delight (which quickly turned to relief) when I learned that just such a community was emerging in my city. I started volunteering with Silver Spring Village, joined the Board, and soon was more and more involved in creating and sustaining the Village. I expected and got great satisfaction from helping the members with a variety of tasks such as transportation, grocery shopping and gardening. I didn’t expect to learn how to prune crepe myrtle or about ballet or Sondheim’s “Follies”. But I did, and I now have interesting new friends who share a vision of a supportive community, and really enjoy working toward it together. Plant & Seed Swap: To paraphrase an old saw, one gardener’s surplus is another’s treasure. If you have any spare plants, cuttings or seeds (or gardening books or magazines), why not share them with others and you may discover something new to grow. If you don’t have excess plants or seeds, come anyway as there is bound to be plenty to choose from. This event is open to Village members, volunteers, and their guests. Four Season Garden Design – Learn from a landscape designer how to create gardens with year-round interest. She will share some of her favorite plants. She will help you extend the beauty into all four seasons. This can be accomplished using plants with long bloom periods, striking flower buds, persistent flowers, seed pods and berries, and through color, texture, structure or shape. She is a Master Gardener and a local licensed landscape contractor, designing, installing and maintaining residential landscapes since 2002. She loves helping homeowners envision and create the gardens they have always wanted. She also teaches garden design to University of Maryland Montgomery County Extension’s Master Gardeners. Throughout the summer a couple of us member-volunteers helped another member beat back weeds and vines in her garden. This member who needed help is practically an expert on plants and gardening and provided a running tutorial about the plants, and guided our work. Then in the Fall, she wanted me to prune her three 15′ crepe myrtles. I had the balance and strength and borrowed tools from neighbors. She taught me how to prune. I found that getting to know each other was the best payoff, though. So spring is coming! How is your Village getting ready for garden season? As our blog readers can see from Peggy’s article sometimes joining a village program can introduce new hobbies and interests into your life that you never anticipated. Lately I have been hearing the buzz surrounding difficult conversations about the decisions that we each must make at the end of life inspired for many by the book by physician Atul Gawande. Many families, villages, faith communities and book groups have been using his book as a way to launch into the much needed conversations with loved ones. Muriel Cole of Home Ports a Village in Chestertown, Maryland that serves all of Kent County shares this article she wrote that was published here as a reprint with permission from the Kent County News. Peter Franchot, Maryland Comptroller, was asked to address a legislative rally in late January organized by United Seniors of Maryland. He walked up to the podium and held up a book. 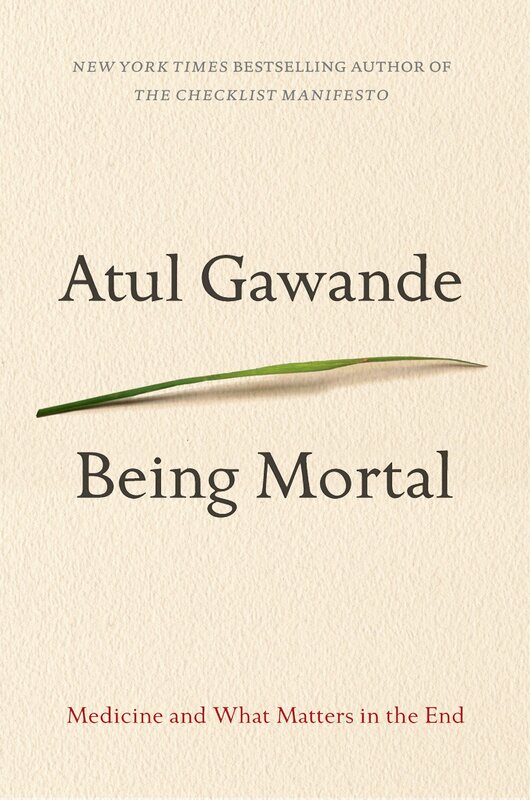 The book he was speaking about is “Being Mortal: Medicine and What Matters in the End”, by Atul Gawande, a practicing surgeon at Brigham and Women’s Hospital in Boston. I was in the audience for Franchot and a lot of other dignitaries that day at the State House in Annapolis and was breathless that he would bring up this book. It’s one of the most thought-provoking books that I have read in a long time. After he left the podium, my hand flew up and, uncharacteristic for me, I ran up to the front and, in front of 300 people, begged everyone to get it and read it. Medicine has limitations and failures, especially at the end of life. Most of us, including physicians apparently, find that hard to face and hard to talk about. Gawande wants Americans and the health care establishment to be more open and honest about medicine’s capabilities. “We should never sacrifice what people really care about,” he thinks. Gawande gives an easy-to-read, concise summary of how medical care for seniors has evolved in this country and the societal context. Using examples of family and friends who have lived to old age, he describes the 21st century situation that many face— the frequent falls resulting in hospitalization, other obstacles, trade-offs, and end -of-life medical treatments that we might not personally choose if we were able to decide. Gawande says, “You don’t have to spend much time with the elderly or those with terminal illness to see how often medicine fails the people it is supposed to help. The waning days of our lives are given over to treatments that addle our brains and sap our bodies for a sliver’s chance of benefit.…Our reluctance to honestly examine the experience of aging and dying has increased the harm we inflict on people and denied them the basic comforts they most need. Lacking a coherent view of how people might live successfully all the way to their very end, we have allowed our fates to be controlled by … medicine, technology, and strangers.” Whew. Gawande emphasizes the importance of listening to what people want. What are our priorities? The Washington Post named it one of the ten best non-fiction books of 2014.